In music, suspense and relief are repeated, like our lives. Chord is one of the expression of suspense and relief. “There once was a boy, Michael. His good family was wating for him at home, with relief and happiness. But the way home was dark and dangerous, with full of suspense. 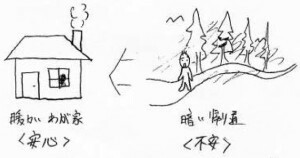 The suspensive way home emphasized the relief of his home…」 That’s right. We rarely notice daily happiness. If there is a suspensive experience before, we can strongly feel a relief. 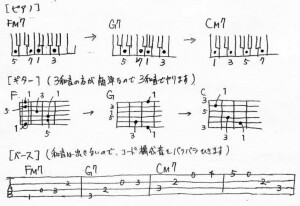 In C key, one of the suspensive chords is G7, one of the relief chords is CM7. Suspensive chord is called “Dominant”, relief chord is called “Tonic”. “Someday Michael visited his girl friend’s house. He spent the enjoyable time with her. He was a little excited because her parents were absent today. But he must go home in the evening, going through dangerous night way. Thinking of the way home, the time with her was felt more enjoyable…” A sigh of relief and a little exciting time. Such chord is “subdominant”. FM7 is that in C key. Let’s play FM7→G7→CM7, and feel the motion Subdominant→Dominant→Tonic. Let’s remember the three classification of diatonic chords.